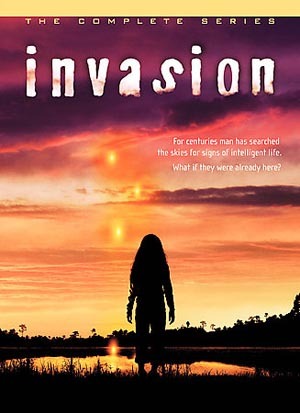 Executive produced by Shaun Cassidy and Thomas Schlamme, the highly touted ABC sci-fi/fantasy series Invasion began when a devastating hurricane roared into the town of Homestead, FL. Among the survivors of the deluge were stalwart park ranger Russell Varon (Eddie Cibrian), his pregnant TV-reporter wife, Larkin Groves (Lisa Sheridan), and their little daughter, Rose (Ariel Gade), who insisted that she saw "hundreds of white lights" darting through the air at the height of the hurricane. Although Rose's parents were inclined to doubt her incredible story, a number of very strange things occurred in the days following the storm. For one, local sheriff Tom Underlay (William Fichtner) began acting like a man possessed, tyrannically imposing a quarantine on Homestead and totally cutting off contact with the outside world. For another, Tom's wife (and Russell's ex-wife) Dr. Mariel Underlay (Kari Matchett) had undergone some profound behavioral changes -- as had several other people in town. Russell's brother-in-law Dave (Tyler Labine), a conspiracy theorist whom no one had previously taken seriously, suddenly seemed to make a lot of sense when he cast a suspicious eye upon his friends and neighbors (or at least, they looked like his friends and neighbors). But it was up to Rose to sum up the terrifying situation in four little words: "Mommy -- you smell different." Although the title of the series did not include "...of the Body Snatchers," the essence of that classic horror film oozed from every frame of the weekly, 60-minute Invasion, which debuted September 21, 2005.